Actor Andy Griffith, best known for his role as the wise sheriff on The Andy Griffith Show and the rumpled defense lawyer on Matlock, died Tuesday at age 86 after a film and television career spanning more than a half-century, the Associated Press reports. Griffith set the show in the fictional town of Mayberry, N.C., where Sheriff Taylor was the dutiful nephew who ate pickles that tasted like kerosene because they were made by his loving Aunt Bee, played by the late Frances Bavier. He was a widowed father who offered gentle guidance to son Opie, played by Ron Howard, who grew up to become the Oscar-winning director of "A Beautiful Mind." Don Knotts was the goofy Deputy Barney Fife, while Jim Nabors joined the show as Gomer Pyle, the unworldly, lovable gas pumper. On "Matlock," which aired from 1986 through 1995, Griffith played a cagey Harvard-educated defense attorney who was Southern-bred and -mannered with a practice in Atlanta. 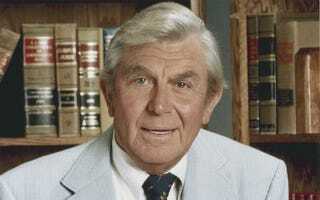 In his rumpled seersucker suit in a steamy courtroom (air conditioning would have spoiled the mood), Matlock could toy with a witness and tease out a confession like a folksy Perry Mason. The character — law-abiding, fatherly and lovable — was much like Sheriff Andy Taylor with silver hair and a shingle. In a 2007 interview with The Associated Press, Griffith said "The Andy Griffith Show," which initially aired from 1960 to 1968, was seen somewhere in the world every day. A reunion movie, "Return to Mayberry," was the top-rated TV movie of the 1985-86 season. "The Andy Griffith Show" was a loving portrait of the town where few grew up but many wished they did — a place where all foibles are forgiven and friendships are forever. Villains came through town and moved on, usually changed by their stay in Mayberry. That was all a credit to Griffith, said Craig Fincannon, who met Griffith in 1974.